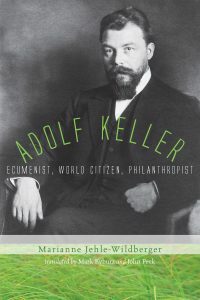 Review of Marianne Jehle-Wildberger, Adolf Keller: Ecumenist, World Citizen, Philanthropist (Eugene, Oregon: Cascade Books, Wipf and Stock Publishers, 2013), 302 pages, ISBN: 1620321076.
Review of Heinrich Rusterholz, “… als ob unseres Nachbars Haus nicht in Flammen stünde” : Paul Vogt, Karl Barth und das Schweizerische Evangelische Hilfswerk für die Bekennende Kirche in Deutschland 1937-1947 (Zurich: Theologischer Verlag Zurich, 2015), 720 pages, ISBN: 978-3290177126. During the first half of the twentieth century, Switzerland occupied a unique place among European nations, due partly to its neutrality in both world wars and partly to its federalist system that gave autonomy to its German, French, and Italian-speaking cantons. In the wake of the First World War, Switzerland became a haven of internationalism. The League of Nations, International Labor Organization, International Committee of the Red Cross, International Peace Bureau, The Women’s International League for Peace and Freedom, and the World Jewish Congress all had their headquarters in Geneva. During the 1930s the Protestant ecumenical movement, comprised initially of two movements, Life and Work and Faith and Order, established centralized offices in Geneva. In the years that followed, all roads for international Protestant leaders passed through Geneva. North American ecumenical and denominational leaders regularly travelled there to meet with European ecumenical colleagues as well as with international refugee workers and diplomats. A number of Swiss-born church officials and ecumenists played prominent roles during this period, but they have been largely overlooked in the historiography. In their day, however, figures like Adolf Keller and Paul Vogt were internationally known, influential figures in the Protestant world. Both of the books reviewed here underscore the significance of their work and the circles in which they moved. Marianne Jehle-Wildberger’s biography of the Swiss Reformed pastor Adolf Keller traces the life and times of an ecumenical pioneer. Born in 1872, Adolf Keller served churches in Geneva and Zurich as well as the Protestant congregation in Cairo. During the 1920s he became active in the ecumenical movement and was elected second associate general secretary of the Universal Christian Conference on Life and Work at its founding meeting in 1925. In 1922 he founded Inter-Church Aid, an ecumenical relief agency that focused on rebuilding and assisting Protestant communities across Europe in the wake of the First World War. His work was concentrated on the plight of Protestant and Orthodox minorities in Eastern Europe, and the chapter on the interwar situation of these communities in Poland, the Baltic states, Austria, and elsewhere is fascinating. The after-effects of the war included widespread poverty, resurgent nationalisms, shifting church boundaries, and growing political and social instability that posed a vital threat to some of the Protestant minority churches. Keller ambitiously viewed his task as raising international Protestant awareness and “promoting Protestant unification,” and he became a driving force in organizing the different denominational agencies that emerged to assist their partner churches in Europe. He also became a remarkably good fundraiser, raising 1.7 million Swiss francs from U.S. and European churches for his work by 1924. Keller’s leadership during the 1920s brought him into wider discussions about the role and purpose of the international ecumenical movement. He was well-known in the United States, serving as a European liaison for the Federal Council of Churches, giving regular lecture tours, and publishing regular op-eds and commentaries in U.S. denominational magazines. After 1933 his prominence gave him an important place in the ecumenical conversations about the Nazi threat. Like other ecumenists, Keller viewed National Socialism and its emphasis on blood, race, and Volk as the antithesis of the ecumenical spirit, and he called for an ecumenical dialectical theology that could make the case against nationalism. He articulated this theology in the 1933 L. P. Stone Lectures at Princeton Theological Seminary, published as Religion and Revolution: Problems of Contemporary Christianity on the European Scene. Despite the widespread concern among European and North American ecumenists about the Nazi regime and the situation in the German churches, there was considerable disagreement among ecumenists about how to respond, particularly during the 1930s. Some of their concerns were strategic. Friedrich Siegmund-Schultze, who worked from Geneva on refugee issues after being expelled from Nazi Germany in July 1933, feared that outside criticism would increase the pressures on the German church opposition. Other complicating factors for Swiss church leaders in particular were the different confessions, alliances, and related theological debates between Swiss Lutheran and Reformed churches and their German counterparts. Keller sought to develop a theological response that could speak to the Confessing Church as well as to the “neutral” leadership in the German Evangelical Church, and he also undertook diplomatic trips to mediate between the different German factions and ecumenical sectors (the Federal Council of Churches sent him to Berlin in 1934 to speak to the German church leadership, for example). His theological efforts were overshadowed by those of Karl Barth (with whom he largely agreed) and his diplomatic efforts grew increasingly challenging, given the growing divisions in the ecumenical movement about whether to maintain ties to all the factions in the German church struggle. An additional complication was that the German Evangelical Church was represented in the ecumenical refugee agencies by Bishop Theodor Heckel, who was critical of the Confessing Church. Keller—who remained head of Inter-Church Aid until 1945 and also led the Swiss Church Aid Committee for Protestant Refugees—had to deal regularly with German concerns from all sides. Keller ended up playing a precarious balancing act at a time when the complex demands on the ecumenical movement provoked competing visions and agendas. There was also a generational shift underway: in 1939, Keller was sixty-seven years old and had been overshadowed in Geneva circles by the thirty-nine-year-old Dutch ecumenist Willem Visser ‘t Hooft. Keller’s ties to U.S. ecumenical leaders, particularly Henry Smith Leiper, were stronger than his ties to European ecumenical officials with whom he had disagreements, and in 1940 Keller went to New York to give a series of talks and workshops on the situation in Europe. He decided to extend his stay (after the war he settled in the U.S. with his family) and in his absence, the ecumenical relief agencies were restructured and the sixty-nine-year-old Keller was moved to the sidelines. Jehle-Wildberger’s book is a fine study of one of the most remarkable figures in ecumenical history, and it also traces the issues and debates that accompanied the expansion of ecumenism, the emergence of different agencies and different international partnerships, and above all the challenges faced by ecumenical leaders in the first half of the twentieth century. Heinrich Rusterholz’s book on the work of the Swiss Protestant Relief Agency (Hilfswerk) for the Confessing Church covers some of the same territory (and naturally includes additional documentation on Keller’s work), but focuses on the Swiss Reformed circles and their responses to the German Church Struggle and the persecution of the Jews. Paul Vogt, the leader of many of these initiatives, is another under-examined figure in the history. Born in 1900, he began his career in 1929, focusing in his ministry on unemployment and other working class issues. He founded a social ministry center, “Sonneblick,” that became a refugee haven in the mid-1930s. From 1936-43 he was a pastor in a suburb of Zurich. 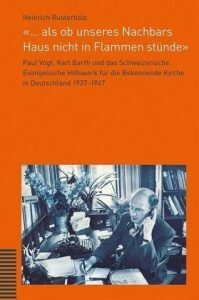 He also began to work closely with Karl Barth, and the two founded the Hilfswerk in 1937 in solidarity with the German Confessing Church; one of their first actions was to organize statements of support for imprisoned Martin Niemoeller. The organization also began to offer seminars in Switzerland for lay and clergy from the Confessing Church. The Hilfswerk membership eventually included about seven hundred Swiss Reformed congregations and their leaders, and by the late 1930s the organization’s work was focused heavily on advocating for and helping refugees. Before the war, most of these refugees came from the Confessing Church and were baptized Christians of Jewish descent. These activities sparked a series of theological position statements about events in Nazi Germany and about the Jewish-Christian relationship. Some of these statements were generated by the Germans who reached Switzerland; others came from working groups of Swiss theologians, including Barth and Wilhelm Vischer. One such statement was the October 1938 statement, “Salvation comes from the Jews,” addressed to Swiss Reformed pastors and condemning antisemitism. These theological statements resembled other church statements of that era—that is, they condemned what they described as Nazi racial antisemitism but did not challenge Christian theological teachings against Jews. Yet the Hilfswerk activities opened the way to a broader engagement that eventually included theological discussions about the Jewish-Christian relationship with the Swiss Jewish community. The most striking aspect of Rusterholz’s book is his extended account and documentation about the cooperation and discussion between the Swiss Jewish community and the Protestant Swiss circles—particularly significant because this kind of ongoing communication between Christians and Jews was otherwise rare during that era. This communication emerged in the early period of the war, when the Swiss Jewish community reached out to Vogt to gain Reformed church support for Jewish refugees. After documented confirmation of the genocide of European Jews reached various officials in Switzerland in the summer of 1942, leaders of the Swiss Jewish Federation (Schweizer Israelitische Gemeindebund) contacted Reformed Church leaders and a series of meetings began between Paul Vogt, Gertrud Kurz, and Rabbi Zvi Taubes of Zurich. The outcome was a November 1942 message that Kurz and Vogt sent to leaders of Swiss Reformed churches that read in part “The Jews of Europe, particularly those in Poland, face a massacre…we confess the guilt of a Confessing Church that it has remained silent for too long about certain realities….” (333). Regular meetings between the two communities began and Swiss Reformed leaders issued various statements, including some that began to address the underlying theological issues of Christian teachings about Judaism. In 1944 George Mandel, a Hungarian businessman who had reached Switzerland and been hired as a consular secretary at the El Salvador Consulate, received an eyewitness account from two Jews who had managed to escape Auschwitz about the circumstances in Auschwitz, including the extent of the genocide. With the approval of the Consul General, Mandel issued documents identifying European Jews as citizens of El Salvador, notarized them, and sent several thousand of these through consular channels throughout Europe. He also gave a copy of the report, the Auschwitz Protocol, to Paul Vogt. Vogt, Karl Barth, Adolf Freudenberg and others used the Auschwitz Protocol to raise awareness across Europe about what was happening to the Jews. The document was circulated to Christian clergy around Europe and in the U.S., with a cover letter from the Hilfswerk, signed by Karl Barth, Emil Brunner, Paul Vogt, and Willem Visser ‘t Hooft. Rusterholz traces these relationships and the theological developments into the early postwar era, when the Hilfswerk turned its attention to the ongoing crisis of refugees and displaced persons. His book shows the full complexity of that period and the figures involved, and the appendix includes helpful biographies and documentation. Both this work and Marianne Jehle-Wildberger’s biography of Adolf Keller are welcome and significant additions to the literature on the churches during the early twentieth century. [*] The views as expressed are the author’s alone and do not necessarily represent those of the United States Holocaust Memorial Museum.